Vue de la Rivière d'Endeavour sur la Côte de la Nouvelle Hollande ou le Vaisseau fut mis à la bande. [Tome IV Pl. 1ère.] - COOK, Captain James. Title : Vue de la Rivière d'Endeavour sur la Côte de la Nouvelle Hollande ou le Vaisseau fut mis à la bande. [Tome IV Pl. 1ère.]. Description :The first known landscape drawing of the east coast of Australia. 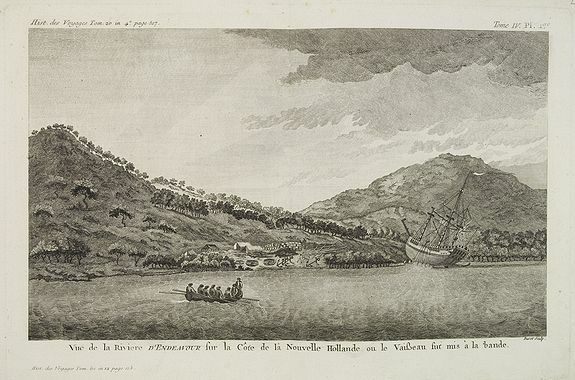 A View of the Endeavour River, on the coast of New Holland, where the ship was laid on shore, in order to repair the damage which she received on the rock in John Hawkesworth. Engraving drawn after Sydney Parkinson, (ca 1745-1771). Sydney Parkinson was a Scottish Quaker, botanical illustrator and natural history artist. Parkinson was employed by Joseph Banks to travel with him on James Cook's first voyage to the Pacific in 1768. Parkinson made nearly a thousand drawings of plants and animals collected by Banks and Daniel Solander on the voyage. He had to work in difficult conditions, living and working in a small cabin surrounded by hundreds of specimens.